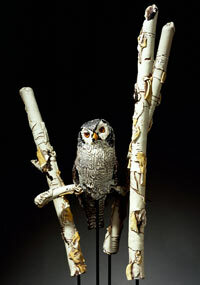 "Northern Hawk Owl in Birch"
We are pleased to be sending you the Spring issue of our e-newsletter as we celebrate the official arrival of Spring, a time of new beginnings and hope. It has been a long and cold winter and we are all looking forward to warmer weather. Holsten Galleries has been very busy this winter with art expositions in Chicago, Palm Beach and Los Angeles and a recent trip to visit our Seattle based artists. 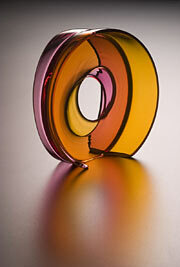 Despite the current economic conditions, it seems that the glass art market is actually quite active. Perhaps part of this has to do with people wanting to invest in something tangible that they think will actually maintain or increase its value over time. At any rate, we are very grateful to those of you who have been our clients in the past and also to those who are continuing to collect contemporary glass! On our end we will continue to do everything possible to offer you the highest quality artwork at competitive prices. Feel free to call or email us to discuss any of the works in this letter or on our website. And have a nice spring! 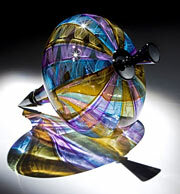 Nancy Callan�s explorations of the fine art of glass has led her to create works rich in craft and technique, but which build upon the past, creating forms and patterns that are both modern and playful. Nancy represents a generation of glass artists that has emerged from the hotshops and classrooms of the pioneers of the studio glass movement. She has studied, taught with, and assisted such prominent artists as Lino Tagliapietra, Ginny Rufner and Joseph McElhany. Her works contain a variety of ideas and shapes that speak to Callan�s unique voice in the field. They are often inspired by the shapes and vibrant colors of toys and comics, such as the “Top” series. These elegant objects utilize traditional techniques such as caning, etching, incalmo and batutto to showcase the rich surfaces that can be achieved with glass. "I love the form and the colors in Nancy Callan’s piece, "Autumn Luster". I enjoyed the contrast between the playfulness of the top and the sophistication of the colors. The translucency of the glass and the delicate cane work make this an exceptional piece." 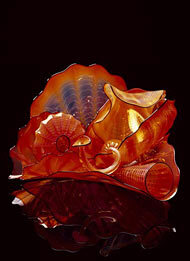 "Nancy Callan’s "Autumn Luster" illustrates the evolving connection between classic glassblowing technique and contemporary vision. Her work, while executed with utmost technical skill, is at the same time fresh, hip, and ethereal." 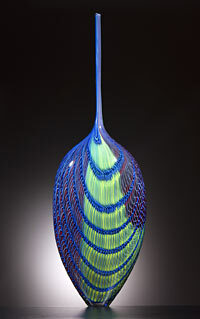 “Autumn Luster” demonstrates Nancy Callan�s understanding of the Venetian Glassblowing technique. What makes Callan�s work so unique is how she embraces the pop Art sensibility with her forms. This is certainly one of Nancy�s finest in the “Top” series. “When I see Nancy Callan�s “Autumn Luster”, I feel the influence of the Maestro in her beautifully executed cane work. The kinetic gesture of the lines of cane, combined with the transparent, subtly glowing colors, create a balanced piece. Many of you have suggested a blog for our website. We are in the process of creating the blog and will let you know when it is in place. Holsten Galleries is pleased to announce that we have added to our website a Secondary Market page.This page will feature outstanding examples of earlier pieces from private collections which are now for sale. These works will be available exclusively through Holsten Galleries. Our latest catalogues are now available for previewing right from our website via a special "Catalogs" button. See the button on the left side of the home page. We will be adding links to videos of many of our artists. Through these links, you will be able to experience the artists as they discuss their work, and watch the amazing process involved in creating art glass. Look for these links on the left side of each artists’ bio page. Debora Moore�s work is inspired by her love of nature and botanical studies. She has both studied and instructed at the Pratt Fine Arts Center in Seattle, and at the Pilchuck School in Stanwood, Washington. Debora�s work has been shown in many prestigious venues, including the Smithsonian Institute in Washington, DC. 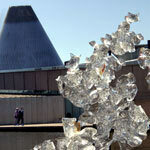 And the Tacoma Museum of Glass in Tacoma, WA. 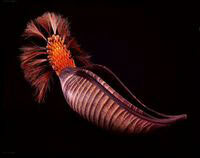 A native of Seattle Washington, John Kiley began blowing glass professionally in 1992, at the age of nineteen. He has worked and traveled with Lino Tagliapietra for the past fifteen years. John has taught glassblowing at The National College of Art & Design in Dublin, Ireland, the Bezalel academy of Arts in Jerusalem, Israel and Pratt fine Arts Center in Seattle. This installation invites the viewer to explore the dynamic facets and planes created by Martin�s artistic interpretation of water. Marquis will be honored by the James Renwick Alliance at the “Masters of the Medium” brunch on Sunday, April 26th, during the Renwick Alliance�s “Spring Craft Weekend”.